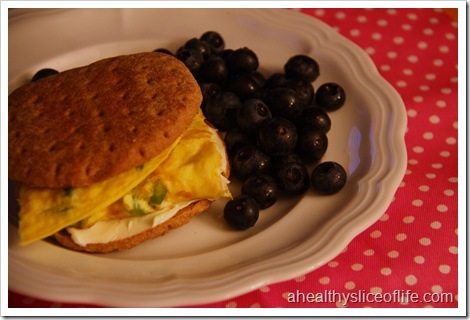 Breakfast consisted of poor lighting, 1 DHA Omega 3 egg, 1 egg white, diced peppers and onions on a Whole Wheat Earth Grains bun, that had a schmear of 1/3 less fat Philadelphia Onion and Chive Cream Cheese. I don’t know if I’ve mentioned it before, but a Tbsp of flavored cream cheese really takes the sandwich to the next level! On the side, 1/2 c of fresh blueberries. Yesterday I woke up at 5:15 on pure accident, so breakfast came early. By 8am I was ready for second breakfast (I’ve been told I eat like a hobbit ;)). 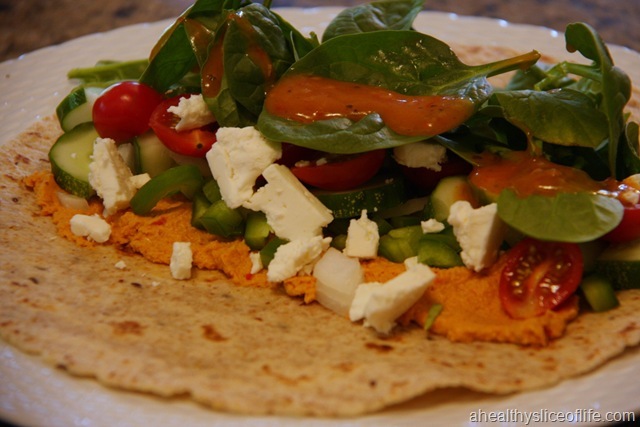 On a La Tortilla Wrap, I loaded on 2 Tbsp of Roots Hummus, diced green pepper, diced onion, sliced cucumber, cherry tomatoes, feta cheese, spinach and 1 Tbsp of Annie’s Roasted Red Pepper Dressing– which I’m quickly falling in love with. Yoga was just what the doctor ordered yesterday. We took it easy which my body greatly needed (more to come in the next pregnancy update!). 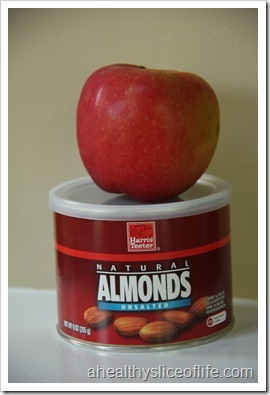 Afterwards, I knew I’d be hungry so I packed an apple and almonds to nip it in the bud. After yoga the apple tasted so sweet and juicy! Between that and 10 almonds, I was satiated. …but not satiated for long. 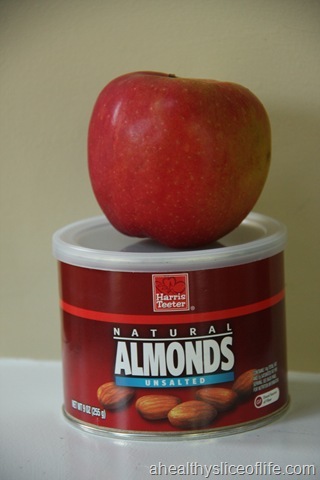 I had a work meeting and figured the apple and almonds would get me through. No such luck. By the time I got to where I was going, I was starving. Luckily I had a free salad coupon hiding in my wallet! 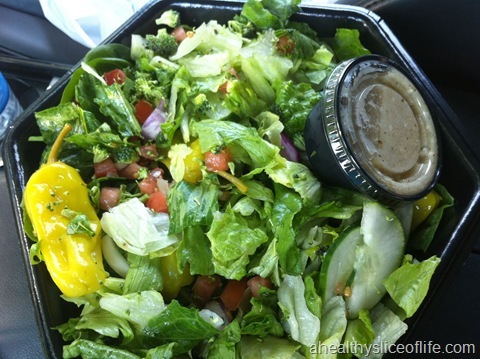 I went to Field of Greens, a custom-made salad shop and got a romaine and spinach base, topped with cucumbers, broccoli, onions, tomato, & pepperoncinis! 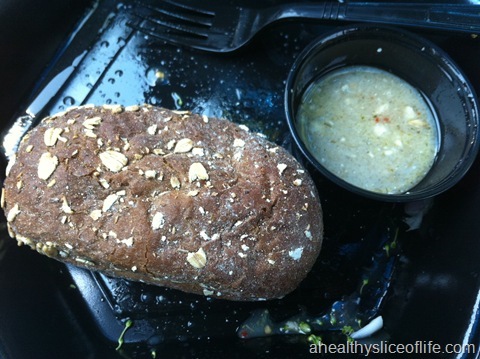 Their Greek dressing is delicious, and I used the complimentary wheat roll as a vessel to get more dressing in my mouth! Even using the dressing for the salad and for dipping, I never use it all up. That’s the importance of ordering it on the side! Dinner consisted of suped-up black bean quesadillas. 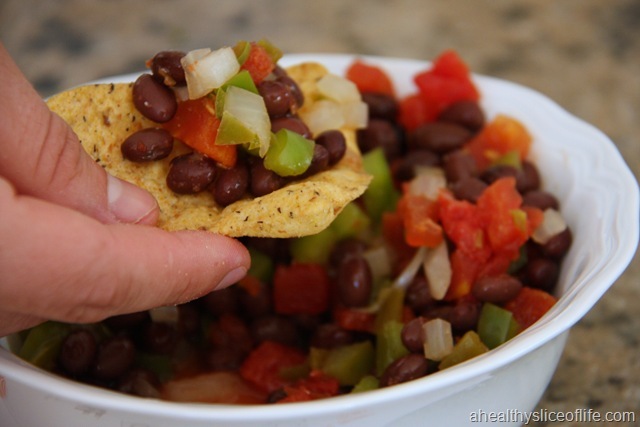 First I sautéed diced peppers and onions until soft, then added in a drained can of rotel and a rinsed can of black beans. Once the mixture was warm, I topped the La Tortilla(s) with the filling and shredded cheese. I ate one delicious quesadilla. The avocado was just for show- it was hard as a rock and inedible. We used the remaining ‘filling’ as a dip. I probably ate about 4-5 multigrain Tostitos with some ‘dip’. So 1 cup of Breyer’s Cookies ‘n Cream in total. Yeah, yeah, the sodium is outrageous. Again. 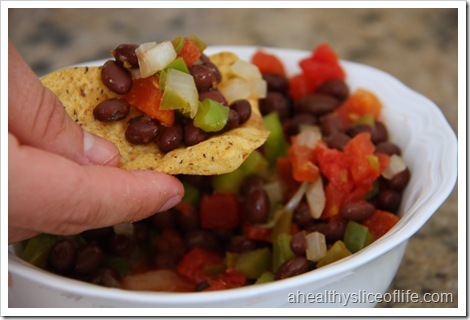 I struggle with sodium because I love dips, sauces, dressings, etc. It’s an area I want to keep an eye on, but am not too terribly concerned with right now. Plus, I rinsed the black beans and drained the Rotel, so it helped cut down on the sodium some, and isn’t reflected in my sodium total. My protein was probably a little low for the day, too. Overall, I am pleased with all the fruits & veggies I got in! I also like that I’ve always been a ‘lots of mini meals’ kind of eater. I’m finding that with my belly getting bigger, I don’t have as much room for big portions, so eating small amounts more often is working out well! And don’t forget to enter my Cascade Cobbler Challenge Giveaway! « Cascade Kitchen Challenge- You Can Take it Too! I like how you call your meals, mini meals. And so true also. Yum! Everything looks so good. I love dips, sauces and dressings too so I’m really having to start watching my sodium intake. The best thing I ate yesterday was a huge salad with field greens, dulse, tempeh, avocado, sunflower seeds, tomato, cucumber and balsamic vinegar. Mmm! 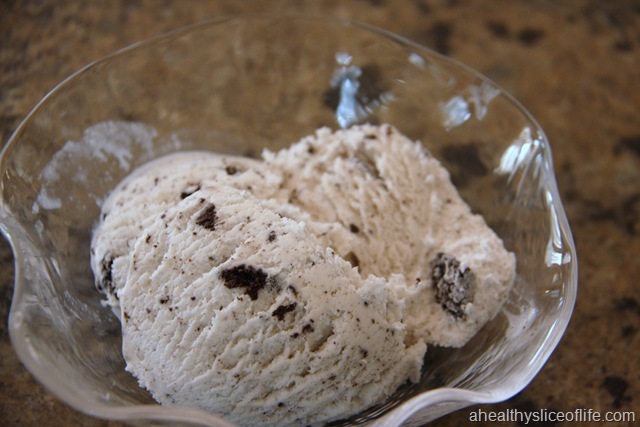 Cookies and Cream ice cream is my all time favorite! It’s so good! Looks like you ate great to me! The best thing I ate yesterday was dinner. Ancho Chicken Tacos followed by watermelon for dessert! So delicious! A day of delicious food! Best thing I ate was homemade broccoli slaw. I used trader joe’s bagged broccoli slaw, added some nonfat plain greek yogurt, tiny bit of Dijon mustard, splash of skim milk, pinch of sugar, celery seed and black pepper. Threw in some walnut halves. Yum! Brittany you eat such good looking foods! Roasted Red Pepper Dressing sounds delicious, I’ll have to look for that one! I really need to start the WIW posts! I find them fascinating to read 🙂 Probably the meal suggestions! Cookies and cream is my favorite! Is it weird that when I eat cookies & cream or chocolate chip cookie dough ice cream, it’s not the chunks I’m looking for, but the particular creamy flavor of the ice cream? Yes. I think it is. I just returned to my vegetarian ways, so I’m especially enjoying today’s rundown- your dinner looks particularly appetizing to me. I ate some pretty yummy and healthy stuff yesterday, but my favorite was a smashed banana, cashew butter, cinnamon, and ground flaxseed on two slices of ezekiel bread + a glass of vanilla unsweetened almond milk. 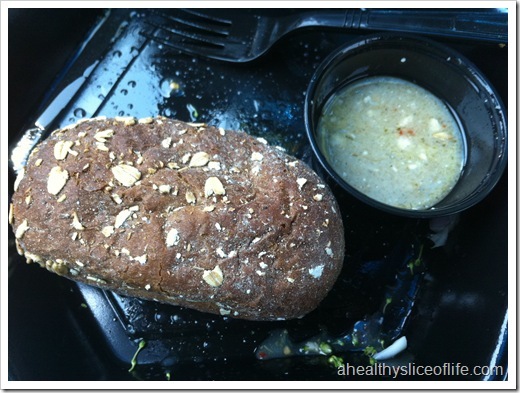 I liked it so much, I ate the same thing again today (swapping chia seeds for the flax)! Hi! 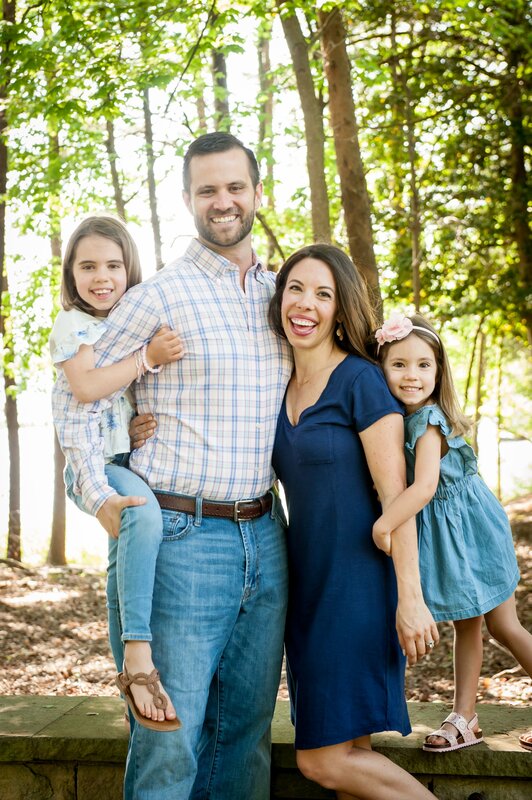 Stopping by your blog for the first time! I have really loved participating in WIAW because I always find new blogs I’ve never read before. Everything looks delicious, but I’m especially eyeing those black bean quesadillas. P.S. congrats on your pregnancy! I love all your healthy veggie eats! Looks good to me. I just wanted to comment on your eggs. 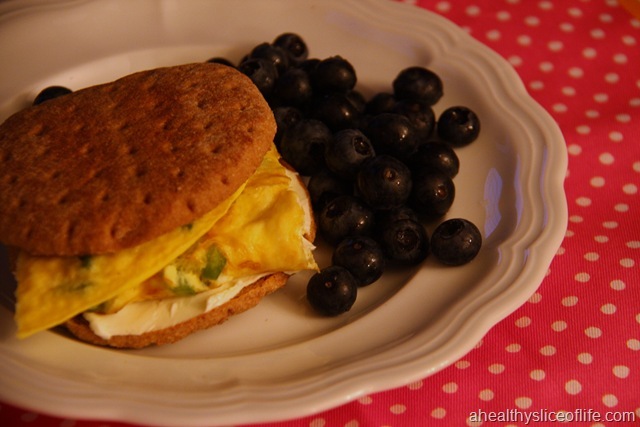 I hope you aren’t spending extra money on those DHA omega-3 eggs only to discard the yolk. I don’t know much about standard egg prices these days so maybe they all cost the same. I actually watched a Modern Marvels last night that was all about the egg and I found it fascinating! There is no nutritional difference between any eggs unless they are fed and organic omega-3 diet, then they obviously have the omega-3s in them. But otherwise, whether they are caged or free range or local or not, it makes no difference. Of course, there are ethical issues involved, but it was an interesting show nonetheless! At least, you don’t have to worry about belly bloat from the sodium. Everyone will assume it’s just the baby! 🙂 The best thing that I ate was salmon. I could eat it everyday! Best thing I ate yesterday was rhubarb muffins! Yum! i must say my dear that your day of food looks delicious!! and i always order my dressing on the side! Yum!!! That salad looks great! 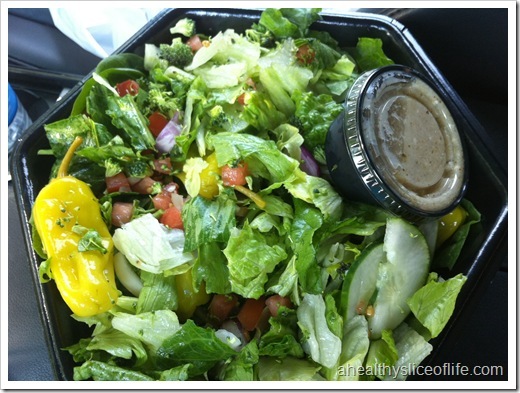 I always order my dressing on the side for the same reason! 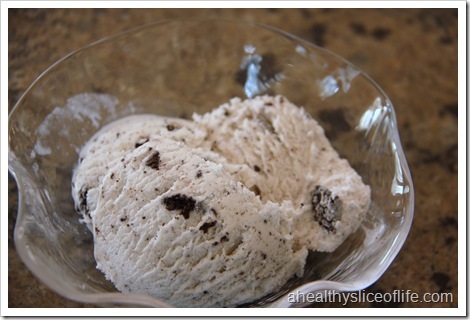 That cookies and cream ice cream looks delicious!! 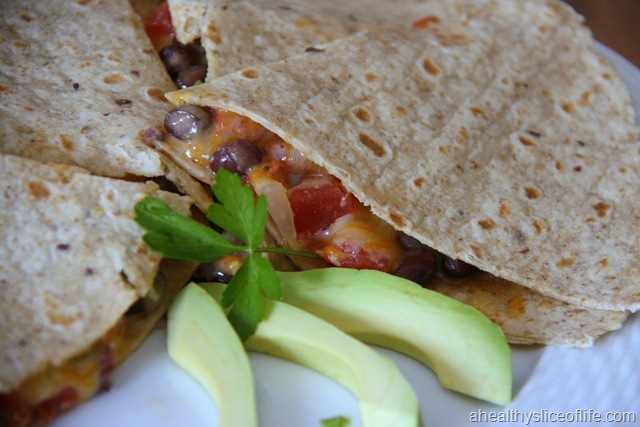 Your quesadilla look amazing (as does everything else)! And sorry about the inedible avocado…I hate it when that happens. You had me at customizable salad with a wheat roll…um…. I need that place near me stat! yum! All your meals look awesome. Sorry to hear about the avocado. I had quite a bit of veggies today too! My favorite meal of the day was dinner: tofu stuffed cabbage! How dissapointing about the avocado. Avocado is one food I look forward to each day lol! If your bp is norm, sodium may not be a huge issue for you. 3000mg is not THAT bad at all!! I love love love everything you ate!! !